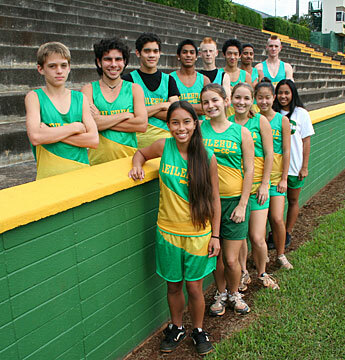 Members of the Leilehua cross country team are (front) Alana Borsa, Kelli Rice, Lauren Crawford, Kaua Segawa and Edna Dasalla; (back) Bryce Jenkins, Jeff Miyashiro, Niko Turner, Jacob Yacapin, Matthew Roberts, Alan Akagi, Rooney Racoma and Steffan Shade. CROSS COUNTRY at Leilehua High School is absolutely a family affair. From their coaching staff to their practices to their "all-for-one" attitude, life for the Mule harriers is all about ohana. This season, the Leilehua cross-country family has enjoyed one of the best overall years in school history, capped by the Oahu Interscholastic Association championship claimed by the Mules varsity boys squad at Waialua High School last Saturday. As evidenced by their finish in the OIA finals, the Mules rely on a well-balanced effort. Although a runner from another school won the individual title (Moanalua's Kalen Darling), Leilehua's Allan Akagi (17 minutes, 12 seconds), Bryce Jenkins (17:13), and Matthew Roberts (17:18) finished fourth, fifth and sixth, respectively, to clinch team honors. 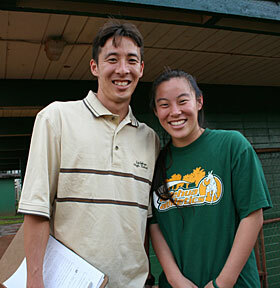 The Leilehua cross country team is coached by Shawn Nakata and Lena Miyamoto. It is the first team league title for the central Oahu school since the OIA began crowning champions in 1971. It was such a good season that all seven boys and three members of the school's girls team qualified for the Honolulu Marathon Cross Country State Championships to be held Friday at Kauai Community College. The success ratio is great for a program that sends 10 of its 13 runners to the state finals. It is no mystery where the Mules runners get their strong sense of cohesiveness. After all, they are coached by the brother-sister tandem of Shawn Nakata and Lena Nakata Miyamoto, who take pride in mentoring athletes at their alma mater. Shawn, a 1996 alumnus at Leilehua, lettered in football, track, cross country, soccer and baseball. He continued to run at Utah Valley State College, where he once ran a personal best 10.6 100-meter dash. Shawn ran the 100, 200, 400 and relays at UVSC. Younger sister Lena starred in track, soccer, volleyball, and cross country for the Mules, and was inducted into the Leilehua Hall of Fame for her efforts in helping the school's 4 x 100 relay team capture three consecutive state championships. Eldest brother Jared was an all-star at offensive line for the football Mules, while dad Melvin was a three-sport star at Leilehua, leading the school to its only baseball state championship in 1962. "I feel really privileged to be able to coach here with my brother where our whole family has gone to school," Lena said. "I've always looked up to Shawn, and that hasn't changed. When I was in high school, he would take me over to the elementary school after my practices to work with me some more. It's because of him that I really began to understand the sports I played." Shawn also sees the value of having Lena coaching with him. "Well, we both have lots of pride because we're coaching here," Shawn said. "It's like our principal says, we bleed green and gold. With Lena coaching, too, it's really easy to communicate. We always know what each other is thinking when we're talking about training or philosophies." The Nakatas' assistant coach, Mike Akagi, is an uncle of brother Jared's wife. An accomplished runner in his own right, Akagi's son, Allan, is one of the Mules' top racers, capturing the OIA junior varsity individual title last year as a freshman. A marathoner, Akagi recently returned home to take a position as a professor at BYU-Hawaii after years of coaching and organizing races in Provo and Park City, Utah. "He's our uncle," Lena said. "He's got a lot of experience and a lot of knowledge, and he has been a great mentor for all of us and he's been a big part of our success, too." Falling in line with the family atmosphere, the boys and girls teams train together along the hills of upper Wahiawa daily, and are usually accompanied by all three coaches. After a middle-of-the-road performance last cross country season, the Nakatas and Akagi decided to implement a summer training program. They also actively pursued runners for a sport which was once considered an offseason attraction for athletes from other sports. The Leilehua summer training included frequent runs of nine, 10 and 11 miles, and even an 18-miler. "We referred to a program that is very popular among successful high school cross country programs," Akagi said. "We did some different things and really changed what we did over the last five weeks of the league season as well." Shawn remembers when things were different. "When I was a freshman, there were only two runners on the team -- just me and my friend Tad Iwata," he said. "The only reason I was able to run during football season was that we would've only had one guy running. "Now we actively look for people who want to run cross country, whether it be talking to kids during P.E. classes, or just getting information about the team out around the school. Even though our participation numbers aren't big, we are able to keep runners in the program and having experienced runners is a big plus." Seniors Rooney Racoma and Steffan Shade have provided veteran leadership this season as Leilehua aims for another first: a state team title. "It's nice just to get recognized after all these years," said Shade, a four-year letter winner and team captain. "We work as a team to improve and we're always trying to push each other to be at our best. This year, when Bryce (Jenkins) came up to run with us, there was nothing but support. He's just a freshman, and he's already going to states with us." Racoma is quick to credit his coach for the season, and his success. "I started my sophomore year," two-time All-OIA pick Racoma said. "During offseason training with Coach Shawn, he saw my potential, and I just kept working with him and getting better and better. "Our workouts, our focus, that's what really made a difference for us. Coach really had us working hard, and now we get to enjoy it. It feel really good that we are getting to take our whole team. We always stick together -- the boys and the girls -- and we push each other. Now we will all get to do it together. "We really are like one big family."